Epilepsy is as such not a disease but rather a description that covers a tendency to epileptic seizures. In principle anyone might experience an epileptic seizure for example in connection with certain diseases or other circumstances such as an accident or trauma. The term epilepsy is used only when there have been recurrent and spontaneously occurring seizures. An epileptic seizure is a sudden dysfunction in the brain where all or many of the brain cells in abnormal ways synchronize their activities and generate their electrical impulses in tandem. Depending on the location and diffusion of this synchronization the attack can have different characteristics. The most common is the seizure which involves the entire body leading to unconsciousness lasting several minutes. But an attack might also be just a few seconds of blurred consciousness which can even be difficult to detect (see Symptoms below). It can take anything from minutes to several years between two attacks and in the meantime the epileptic notices nothing unusual. The type of epileptic seizure says something about where in the brain it occurs and what type of epilepsy it is. Epilepsy can have many causes. 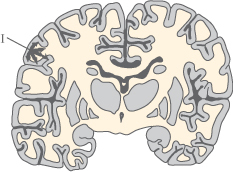 Disorderly development of the brain in the embryo stage. An episode of lack of oxygen to the brain for example during birth. Heavy blow to the head, usually with cranial fractures or worse as a result. Infections in and around the brain (encephalitis and meningitis). Blood clots in the brain and brain haemorrhages (collectively referred to as stroke). In some epileptics the trigger cause is never found. Why and exactly how all these influences and diseases can lead to excessive synchronization of brain activity and therefore epileptic seizures is not known. The type of epilepsy is categorized, among other things, according to the type of epileptic seizures which occurs, age at first seizure and the underlying cause if known (seizure types are described under Symptoms below). From this picture and several different criteria it is possible to diagnose various epileptic syndromes and determine the best treatment (see Complications and Outlook below). In the developed countries the number of epileptics equate to around 1% of the adult population. In more than ¾ of epileptics the attacks have started during childhood. It should be mentioned that febrile convulsions, which is a relatively common form of seizures in children, are not counted as epilepsy, although such convulsions are very similar in nature. The symptoms are the epileptic seizures. Between attacks there are no signs of disease and epileptics live perfectly normal lives. There are, as mentioned, many different types of seizures, and only the most important is mentioned here. Common for all attacks is that some brain functions cease temporarily, and show signs of abnormal brain activity such as convulsions in the muscles, unconsciousness and in some cases musculoskeletal disorders, sensory disturbances or speech disorder and more. Normal brain function quickly returns with the seizure lasting from a few seconds to a few minutes and rarely longer. Seizures are classified as generalized or partial attacks, depending on whether the whole brain or only a portion of the brain is involved. 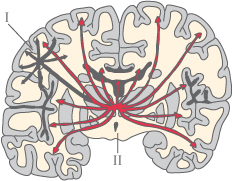 An attack that begins as partial may in some cases spread and become generalized which involves the entire brain and is characterized by loss of consciousness. The person has no memory of the attack afterwards. spreads to the mid brain. Attacks begin with sudden loss of consciousness where the person collapses and often turn the white out of the eyes. The person will then be very stiff with stretched legs, bent arms and the head bent backwards. This is followed by jerky convulsions of arms and legs. The person may have froth around the mouth or may bleed from biting the tongue and there may be release of urine and faeces. The person stops breathing and turns pale or bluish during the attack. After a few minutes the attack is over and the person starts breathing and regains consciousness or fall into a deep sleep. The person may be very tired, sleepy and confused for a long time after an attack. This seizure type is seen almost exclusively in children and adolescents and is the opposite extreme. Attacks consist of a few seconds of blurred consciousness where the child becomes inert and "lose the thread." The glance is starring or turned upwards. The child does not collapse and very shortly continues normal activities as if nothing had happened. The child is not even aware that it has had an attack, and it may be difficult to detect child absence even if the attacks occur frequently in the individual. One sign is often that the child has difficulties following the school curriculum. Are very short muscular twitches in the arms, legs or neck. They resemble the jerky movements often seen in persons falling asleep but the epileptic myoclonic seizures appear abruptly when awake. They might appear singularly or in series of seizures and be symmetrical or asymmetrical. A sudden very short loss of consciousness with complete loss of muscle strength with the person collapsing hard onto the ground without ability to prevent or mitigate injury. The person regains consciousness immediately but will very often have been hurt quite badly from the fall. I. Location of the attack. and affects only the immediately surrounding areas. In partial, also called focal, seizures only a part of the brain is involved. The symptoms during the attack depend on which part of the brain is involved. Overall the partial attacks are divided between simple and complex attacks depending on whether consciousness is affected. Are without consciousness influence. Symptoms depend on what the affected part of the brain controls and are often isolated to a single or a few body parts. It may involve rhythmic twitching or sensory disturbance. Other brain areas result in different symptoms such as impairment of speech, eyesight or hearing. In some cases simple attacks turn into complex or even generalized (see above). Do nothing during the attack except preventing the person from injury. If the person vomits gently turn the person onto the side to prevent choking and reversion of fluids into the lungs. Don’t move the person unless the ground or the surroundings pose a danger for example if the attack has taken place on a stairway or in a street. Remove objects in the vicinity which may cause the person harm or injury and place something soft such as a folded sweater under the head. Don’t restrain the person by gripping or holding and don’t insert anything in the mouth to prevent tongue biting as this might do the person more harm than good. Watch the person carefully in order to be able to afterwards describe the incident accurately to the doctor which helps facilitate the diagnosis. Call an ambulance if the attack lasts for more than 2 to 3 minutes or if several attacks occur with short intervals. When the convulsions have ceased place the person in a recovery position. Check if the person carries a card with information about an epileptic diagnosis. Is this the case then a doctor should not be necessary except if the above mentioned situation has occurred. If a card is not carried then ask the person after the attack if a doctor should be called. Stay with the person until full consciousness has been regained. If it is the first time the person has had a seizure then hospitalization and a full examination is required. The diagnose of epilepsy is made on the basis of a history of multiple, spontaneous seizures, as well as specific changes in brain’s electrical activity measured with electrodes on the scalp, known as EEG, the abbreviation of Electroencephalography. This examination is usually supplemented by the images of the brain in the form of CT or MRI scanning. Which epileptic syndrome it concerns is assessed not only based on such examinations but also by weighing in other factors as above mentioned. Epileptics largely live as everyone else. Some should be aware of certain things in everyday life. Certain impact might trigger seizures in some epileptics. It can be excessive alcohol consumption, sleep deprivation or other stress factors. Some react to flickering or flashing lights such as a TV or light show at the nightclub or concert. An epileptic cannot obtain a driving licenses unless the latest attack is more than two years back and persons with epilepsy are legally required to contact the relevant driving license authority for further explanation. Where a person has a tendency of epilepsy there may also be restrictions against certain work such as handling dangerous machinery or the pursuit of extreme sports or swimming. Epileptic patients should always carry a card with relevant patient information about the condition and type of the epilepsy. Epilepsy is predominantly treated with special medicines called anticonvulsants. These inhibit the exaggerated signals in the brain leading to epileptic seizures and might be taken as a preventive medication. Only rarely can the cause of epilepsy be treated but one example may be a brain tumor which can be removed by brain surgery. Treatment with anticonvulsants is a specialist task. The different types of medication work best with particular seizures or epilepsy type. Sometimes a combination of medicines is needed to obtain the best result. The medication might have unpleasant side effects and works with different effect for different persons. Nonetheless, most patients achieve complete seizure freedom with the right medication. Women on anticonvulsants planning a pregnancy must confer with their doctor before conceiving as the medication might have to be altered to reduce risk of fetal damage. The outlook for epilepsy depends to a large degree on what kind of seizures are involved, how often they occur and what is causing the epilepsy. Epilepsy which develops in childhood may disappear altogether soon after adolescence and for many epileptics the frequency of seizures abates over time. The physician might try to wean the patient of the medication if the latest attack is more than 5 years back in time. Some epilepsy changes nature over time one example being child epilepsy which might disappear altogether or turn into generalized seizures in adulthood. Many epileptics have no problems other than epilepsy, but if the cause is an underlying disease or brain injury there might be complications and a different outlook. Even the violent generalized seizures are usually not dangerous for the person, apart from the risk of hitting the head against some object during the attack. In the rare cases where a generalized tonic-clonic seizure lasts more than a few minutes, there may be complications due to lack of oxygen if the person’s breathing has stopped during the attack. This can potentially lead to brain damage or at worst end fatally. Another danger is repeated generalized seizures shortly after each other. This can lead to so-called status epilepticus, which is a potentially fatal condition in which one epileptic seizure replaces the next. Status epilepticus is treated aggressively with medication. Generally, the outlook for epilepsy depends on the underlying disease and how well it is managed medically. Frequent epileptic seizures result in long term irreversible damage in the brain.